On July 9, Donald Trump announced that he had selected Judge Brett Kavanaugh of the U.S. Court of Appeals for the D.C. Circuit to fill the Supreme Court seat soon to be vacated by Justice Anthony Kennedy. Here’s what you need to know about this Yale grad, former Kennedy clerk and handpicked selection of the Heritage Foundation, who at just 53 could shape judicial precedent for decades if confirmed. Join fellow Care2 activists calling for robust, thoughtful confirmation hearings for Judge Kavanaugh. First, to the big issue on many minds: If confirmed, what could Kavanaugh do to abortion rights? Like many judges, he’s often dodged on Roe v. Wade, the landmark 1973 case affirming the right to privacy and access to abortion. 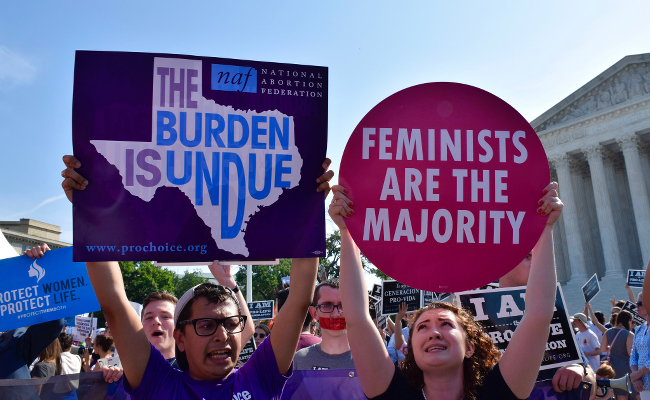 But Kavanaugh has ruled on abortion cases in the past, and legal reporter Mark Joseph Stern fears that he may interpret the “undue burden” standard as loosely as possible — effectively undoing Roe v. Wade by finding that restrictive anti-abortion laws don’t violate this standard. In 2006, Kavanaugh said he would follow the decision “faithfully” — but the question remains whether that would include a robust interpretation of what “undue burden” means. But there’s another thing about Kavanaugh that should scare you. He is on record as saying that sitting presidents shouldn’t face civil or criminal charges — and they should have the ability to dismiss special counsels. According to Kavanaugh, presidents should also be allowed to violate the law if they think the law isn’t constitutional. These comments should ring alarm bells given that the president is currently under legal investigation, while his executive orders are being challenged in court. And he speaks from experience: Kavanaugh clerked for Kenneth Starr, the special counsel who investigated President Bill Clinton. He’s also very popular with the Family Research Council, an anti-LGBTQ hate group, which may give you insight into his opinions on LGBTQ civil rights. Unsurprisingly, given his popularity with groups like the FRC, Kavanaugh has supported “religious liberty” in health care settings, which opens up the possibility of formalizing discrimination against people who need birth control, miscarriage care and other treatments that “conscientious objectors” say they don’t want to cover, perform or assist with. And in case you’re wondering, no, he doesn’t support the constitutional mandate for separating church and state. Advocates also fear that Kavanaugh could be a deciding vote in dismantling the Affordable Care Act. This would be dangerous for many Americans, but especially the disability community, which has seen expanded access to care under this legislation. Kavanaugh’s record on the subject of net neutrality is alarming as well; he thinks it’s “unlawful” to protect the rights of users to access information freely on the internet. Meanwhile, the NRA is thrilled about the nomination of a judge widely perceived as pro-gun rights. If you think he’s pro-civil rights in general, you may want to consider: Advocates warn that his record on voting rights isn’t ideal, an ominous sign given that this issue may land before the Supreme Court in coming years. He also has a terrible record on environmental law, doesn’t support labor rights, disapproves of agencies like the Consumer Financial Protection Bureau and opposes affirmative action. And Kavanaugh has ruled in ways that affirm the Trump administration’s racist immigration policy. And another thing: Mitch McConnell isn’t thrilled with Kavanaugh because of the volume of documentation and material he’s generated over the course of his career. According to the New York Times, McConnell fears that Democrats could use this material to delay confirmation hearings – you know, because Democrats would like to thoroughly evaluate the record of the nominee as part of the confirmation process. You’ll be hearing much more about Kavanaugh in coming days and weeks. Now is a good time to contact your senators and express your opinion on confirmation hearings and the nominee. If you’re not sure how you feel about Kavanaugh and his record yet, that’s okay! Many people hadn’t even heard of him until Monday night. But your uncertainty is further evidence that the Senate should take its time to thoughtfully check out his record and hold confirmation hearings that give them a chance to ask questions about how he sees the role of the judiciary in American life. Join Care2 activists asking the Senate to thoroughly evaluate this Supreme Court nominee and hold him accountable for his dangerous record. The rich have always had a big say in how things are run. The only difference is which rich. The only way we can turn this current trend around is through elections. We need to turn the US around. Trump is destroying this beautiful country by allowing the rich have big says in how things should be run. This includes the Supreme Court. Young people need to pay attention because our future depends on them. HE IS NOT THE SUPREME JUDGE AMERICA AND OUR DEMOCRACY NEEDS AT THIS TIME AT ALL. ALSO TRUMP'S BEING AN OFFICIAL PRESIDENT IS NOT CONFIRMED AT ALL DUE TO RUSSIA;S MEDDLING, THEREFORE HE HAS NO RIGHT TO SELECT A NEW JUDGE CURRENTLY UNTIL AMERICA TRULY KNOWS!!! It is only a few days past judge Kavanaugh's nomination, but already the opposition has lost most of it's momentum. The arguments against his confirmation seem so trivial, the doomsday predictions are too speculative and are being brushed aside. Democratic Senators seemed resigned to the fact that Judge Kavanaugh is a decent man and the best they can hope for. Some Democrats still feel obligated to put up a show of resistance, most are resigned to the success of Judge Kavanaugh's confirmation to the Supreme Court. Calling on all caring and ethical Americans to vote with their heads and their hearts.